The crowd was constant but fairly moderate in that hall, but the same could not be said about the auditoriums, as they were jam-packed! 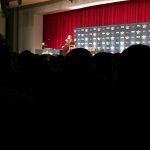 This was a show where the attendees were focused on the panels, as each one that I went to was basically “sold out”, with every seat filled, some hours in advance, a problem that NYCC will have to address–more on this later! 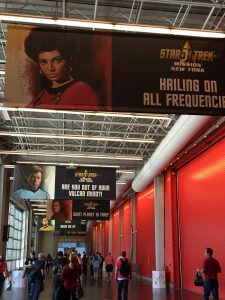 It was grand to see all iterations of Star Trek represented through cos-play, and it was particularly gratifying observing how many younger fans were decked out in “TOS” finery. 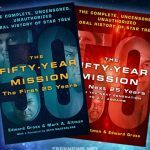 Beyond that, there was a camaraderie in the building that belied the supposed “rivalry” among fans of the various shows, a point made more than once by actors, authors, or historians during their panels. Carolyn joined me for that one, with Melissa soon to follow (we saved her a seat, and–don’t tell anyone– she lied to the gate-keeper to get in! ), as we knew that the ensuing panel, “The Women of Trek” was going to be a “hot ticket”. Featuring Marina Sirtis, Nana Visitor, and Terry Farrell, it was the highlight of the show. The ladies spoke openly about their lives and careers in-and-out of Star Trek. There were deeply personal stories, and lots of laughs, too, but it was in those moments discussing the show and its impact that the deepest, most emotional moments occurred. At points, it felt as if everyone in the room was laughing or sobbing in unison, with each of the ladies bringing those feelings out in their colleagues as well. Meeting up with some in-for-the-day dear friends, we took a tour of the building that included scoping out the line that was already forming for the 3 PM talk by Walter Koeing–which by de facto was also the sort-of queue for the 4 PM William Shatner event, as everyone had gotten the lay-of-the-land by that point, and decided that “squatters’ rights” were as good as gold! Obviously, as an original “Trekkie” I wanted to have a chance to see Mr. Shatner speak, but it seemed a dim hope as we approached the Main Stage just before Mr. Koenig’s talk began, as there were already more than a hundred people massed in what they were calling a “Shatner stand-by line”. As ReedPop and their security team weren’t clearing the halls, they didn’t feel that anyone would leave the room, so there seemed scant hope that we could get in, but we decided to wait the hour, just in case. 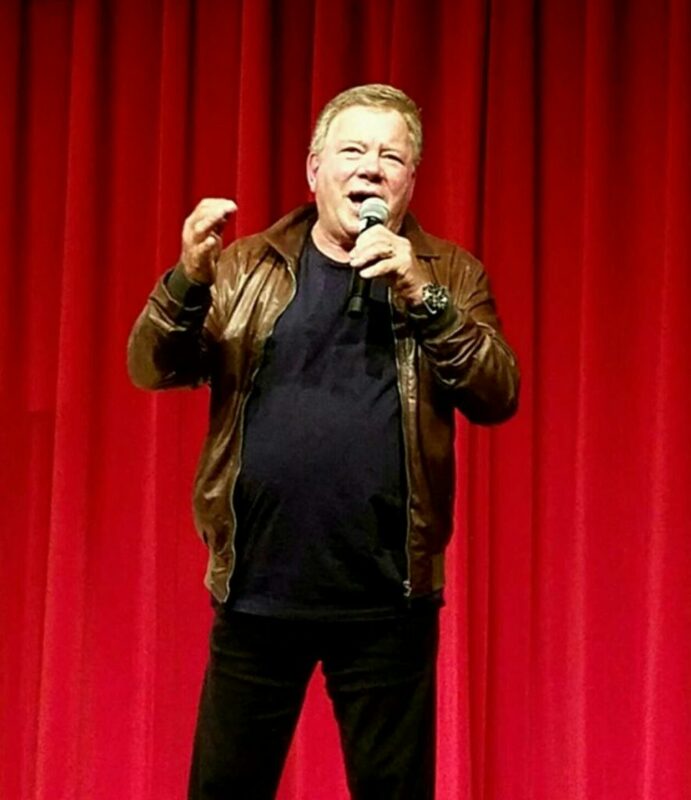 As the time passed, there were many announcements that suggested that wait would be in vain, and as barely a soul left the auditorium, they seemed accurate; at this point, I would have been happy with catching a glimpse of Mr. Shatner walking into the room and would have called it a “win”. The event was just about to begin when they opened the doors to let some straggling V.I.P.s into the room , and we could see “Captain Kirk” patrolling the stage, which was as close as I thought I would get until they began letting our crowd in, but only 20 at a time. As my count of the people who had left was only at two dozen, I didn’t think we would make the cut, but after some fits-and-starts (including one that left us five bodies from the door–shades of our friend Sarah and Sir Terry Pratchett! ), we were actually and at long-last ushered into the room! He told amazing stories about his early career on Broadway, current projects that include a hard science documentary, and a interview with Steven Hawking where the professor asked Mr. Shatner about his favorite episodes! After recording our “Con Re-Cap”, Carolyn & I walked Melissa to the Port Authority Bus Terminal for her ride home, and then headed over to the legendary Algonquin Hotel, where we meet friends for cocktails and conversation, with hopes that ReedPop will have us all back next year, as that would be the 30th Anniversary of Star Trek: The Next Generation!